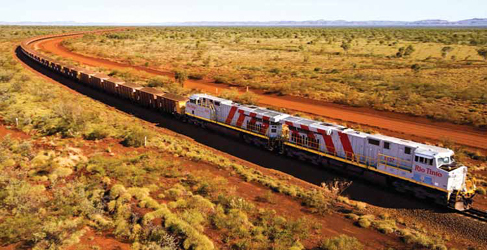 Automated trains transport iron ore from Rio Tinto’s mines in the Pilbara to its port facilities. Rio Tinto has achieved a significant milestone with the first delivery of iron ore by an autonomous train in the Pilbara, Western Australia. The autonomous train, consisting of three locomotives and carrying around 28,000 metric tons (mt) of iron ore, traveled more than 280 kilometers (km) from Rio Tinto’s mining operations in Tom Price to the port of Cape Lambert on July 10. It was monitored remotely by operators from Rio Tinto’s Operations Centre in Perth more than 1,500 km away. The inaugural journey is a significant milestone for Rio Tinto’s AutoHaul program and follows regulatory approval in May. AutoHaul is on schedule to be completed by the end of 2018. The $940 million AutoHaul program is focused on automating trains transporting iron ore to Rio Tinto’s port facilities in the Pilbara region of Western Australia. Rio Tinto operates about 200 locomotives on more than 1,700 km of track in the Pilbara, transporting ore from 16 mines to four port terminals. Locomotives carrying AutoHaul software are fitted with on-board cameras allowing for constant monitoring from the operations center. Paraburdoo Getting New Stackers: In other news from Rio Tinto Iron Ore, the company has initiated a $39 million sustaining capital project to replace the stackers that distribute ore to stockpiles at its Paraburdoo mine. Tenova TAKRAF is leading the design and implementation phases of the stacker replacement. Design of the new stackers is under way, and fabrication is expected to begin later this year. Installation and commissioning are scheduled for completion by 2020. Fabrication, including preassembly, will take place in a Perth workshop. So far, the project has awarded a multimillion- dollar sub-contract to Western Australian company Paradigm Engineers to provide electrical-engineering design and control-system programing services, as well as to supply the electrical equipment. The old stackers were part of the mine’s original infrastructure, stacking the very first load of iron ore from Paraburdoo in 1972. In 46 years of operation, they have stacked a little more than 800 million mt of iron ore, requiring only minimal structural changes throughout that time. The stacker-replacement project forms part of Rio Tinto’s broader sustaining capital program estimated at $1 billion a year over the next three years.